Did that one item that you always wanted in Valve's Team Fortress 2 just never drop? Now you can buy it. Valve's popular FPS has been getting steadily more MMO-like since its inception, with characters getting a persistent inventory, loot drops, and even crafted items. Now, Valve is adding another of the free-to-play MMO mainstays: microtransactions. The "Mann-Conomy Update," as outlined on the official TF2 site, will use the recently-introduced Steam Wallet system to purchase in-game items from the special Valve store. While the only items initially available for purchase will be the new goodies found in the "Polycount Pack," Valve seems to be intending on adding every almost single item to the store - eventually. It's still Valve Time over there, after all. 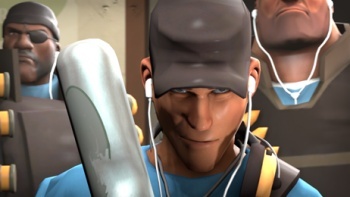 The TF2 team would like to assure players that they will not be selling maps - in the interests of not splintering the community - and that every single item that is purchasable will still be a drop in the game, so nobody will be able to buy an advantage, only convenience. The developer will still be rolling out free updates to the game as it always has, reads the blog page. And yet, none of that will stop the almost-certainly-impending deafening outcry from the community that Valve has "ruined TF2!" In other news, I am apparently a psychic.